I set up the interview at Cultivate7Twelve's main desk, kind of leaning against the baby grand piano on the dance floor. C7T's founder, Rebekah Geare, is energetically speaking to a lady in flowing clothes. Wood-burning, handmade crafts, local artist displays, yoga, dinners, dances, bands, church plants, meetups, and private events are just some of what you can expect to find in this prime Waco location, nextdoor to the Hippodrome. 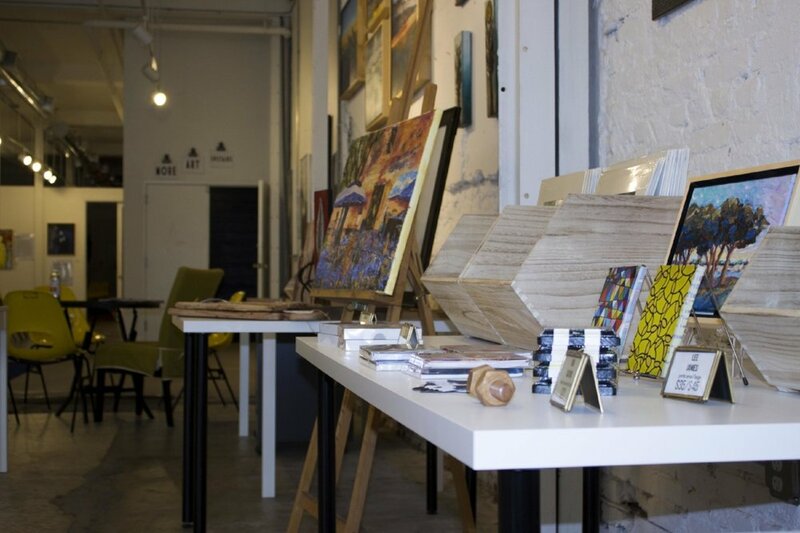 Marsha heads upstairs to the artisan office spaces, where several creatives have easels, supplies, and booths for their work, often displayed for sale downstairs in the event rooms. Rebekah is ready for one of the most fascinating interviews I've ever had. Here are just a few excerpts. What made you start this place? "Basically. It’s such a long story…" says Rebekah. "I saw the need for an event place in Waco, and a place for artists to showcase their work. Then I met Fiona Bond who helps artists showcase here in Waco. When I walked into this space I knew what I wanted to do with the building." "I have a background in non-profits, doing galas and fundraisers, and so I appreciate the need any city has where people can come together and connect. And I LOVE the way that art facilitates that connection, even between strangers. And so I see this as a space not only where you can get to know somebody, but you can get to know Waco through the eyes of its artists." Rebekah takes a long pause, judging whether to get really personal or not. She does, of course. "And my passion, like personal passion, is love of community. I have always loved bringing people together. And so this building is very much an expression of a life of dreaming of what it would be like to have a space that brings people together. The building itself is my art." What led to those thoughts and ponderings that you had? "I’ve had a passion for people. Both my parents are caregivers – my Dad is a therapist and my Mom is a nurse. I’ve grown up watching them pour their lives into people, and they’ve taught me just to see the best in people." "I’ve come to believe over time that the way you structure an event or a meeting, whether a dinner in your home or a 400-person fundraiser, that structure is what allows people who maybe otherwise would stay in their shell to reach outside of themselves and encounter the best parts of somebody else." "I really believe that we’re here to know and be known. That’s the whole point of our lives. And I love storytelling as part of that. Every piece of art is a story!" "I see as my job as a curator is to tell those stories. And that’s why art provides the perfect environment to ask those important questions about who we are and where we’re going and why we’re here." What are some memories of that connection happening here? "We just recently had an exhibit here featuring Charles Wallis. His art – he did an exhibit called The World of the Empath – and on our debut night we had a number of people who got halfway through the show and had to go to the bathroom because they had teared up. They saw something expressed in images and words that was a part of them that they had never been able to say that themselves." "It was creating a moment looking into a mirror that was so gentle it lets you actually like what you see. That moment was a total answer to every hope we’ve sewn in here." What would even regulars find surprising? "Our art-to-table experiences with Happy Harvest. It’s four courses each inspired by a piece in our show. We use a chef named Juanita Barrientos who comes out and explains how. First the artist explains what inspired him to make the piece, and then Juanita explains what inspired her to make the dish, and we eat it at a farm-style table!" "I’ve had better, dynamic conversations with total strangers than I’ve had in my whole life. It inspires people to talk about things that are substantial – whether your past or your dreams – the intimate expression of food as story and paint is just so inspiring it makes you open up." What will make or break the future of this place? "It’ll be our ability to succeed as an event space. While we absolutely believe our art that’s here is kind of our beating heart, it’s not what produces the most – it’s not our most robust revenue stream. Everything else kind of exists to allow the art to live here." "So if you’re interested in supporting this space, the best thing you can do is come and enjoy it! So have your birthday here, or anniversary party, next corporate mixer, and wedding party here. Enjoy the art and the fact that it does engender excellent conversation and connections with people that you like." "The true mark of our success will be that we’re booked with events every weekend. And so to that end we have, when you rent with us, glassware, chairs, excellent relationships with food and drink vendors in town, and we work to be sort of a concierge for you to make it really easy to put together an event in our space." It's always our last questions in these local owner interviews. Rebekah doesn't hesitate. "Oh, that’s easy," she says. "I love the people. Waco is a beautiful place, and there are all sorts of things that are sometimes good and sometimes bad – but the PEOPLE are consistently awesome. They’re genuine, interested, thoughtful, and driven by the desire to live life well I think. Success here isn’t measured by what you own. It’s much more measured by the way you fill your days: with friends, family, and meaningful pursuits." Well, I'm inspired. Rebekah is the type of owner that makes Towny proud to help people connect with their local businesses. Now go book an event at Cultivate7Twelve and see what it's like to be better-known over art, food, music, and Rebekah's special smile.